I think the opinion that wins this in the thread is that BES will stay at the $45 rate, but I think it's probably best to wait until they put out the public announcement and see what they really have to offer. Yeah, I'm hoping its a price reduction across the board, 15 bucks difference to use a BES is kind ridiculous. I don't see why it matters if you use a BES. How does that impact Cingular? If anything, it lightens their load! Thanks -- that setting does look new. I'll have to try it again to see if it actually works. EDIT: Nope. Still doesn't work. Guess I'll stick with Yahoo. Last edited by bigboy : 06-06-2006 at 05:18 PM. I'm not sure if this is the same, as you seem to have more POP knowledge than me, but when I receive something from my gmail on my BB it is left on their server and I can still pull it down from Outlook 2003 marked as unopened. It does work. I just tested it three times. When I POP my Gmail account to my Apple Mail inbox, the Gmail copy remains in the inbox, unread. 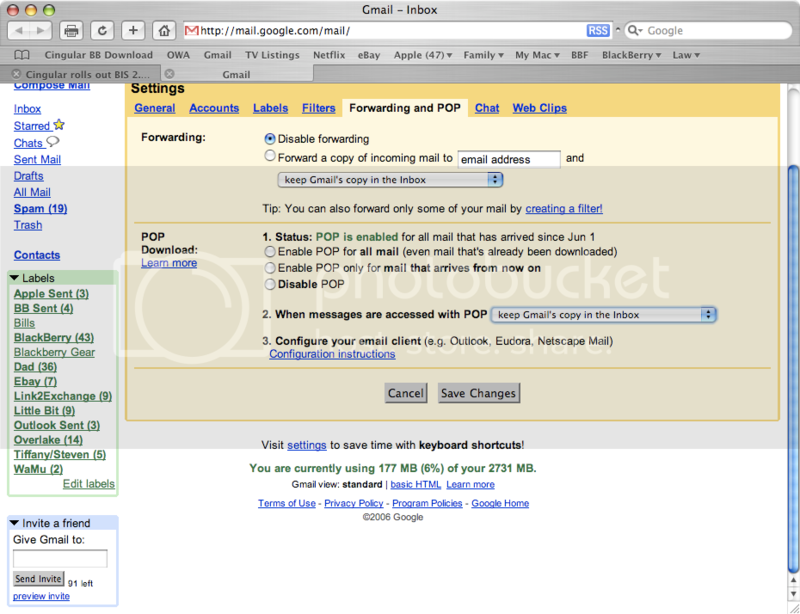 If yours does not, then it is not Gmail, it is your email program's setting. You must have it set to something like Remove From Server after it checks the Gmail acct, or you do not have a box checked that reads something like Leave Copy on Server. It's not the Gmail side though. I use EMM as my BES. How does Cingular know what I use? Begs the question of why wouldn't my price drop to the $29.99? The copy of the e-mail still resides in the Gmail inbox unread -- I can see it on my browser. However the second pop client does not see it. Your test is missing a second pop client trying to download the message (try downloading the messages on Apple Mail on either two different machines or accounts). Viewing the message from the Gmail browser interface does not count as a second pop client. Last edited by bigboy : 06-06-2006 at 06:28 PM. Originally Posted by Winston S.
Are you forwarding your Gmail or are you accessing Gmail via BIS accounts? Last edited by jdjleo : 07-09-2006 at 01:05 AM. How does Tmo differentiate between BES and BIS users, becasue you cant sign up for a BIS plan and use BES. You suddenly upgrade and you can do enterprise activations. lol. true, but i'll take a beta gmail over hotmail/livemail/yahoo any day. From my experience, I just called a CSR and asked to be put on one of the BIS plans. If you ask for a certain plan, they will sign u up for it. However, even if you are NOT on a BES, you still get the BES Activation icon on the home screen, which I don't understand why. I hide mine. Anyone know why this icon shows up even if you're not on BES? I don't plan on changing plans until needed. I am accessing my gmail via a BIS account. 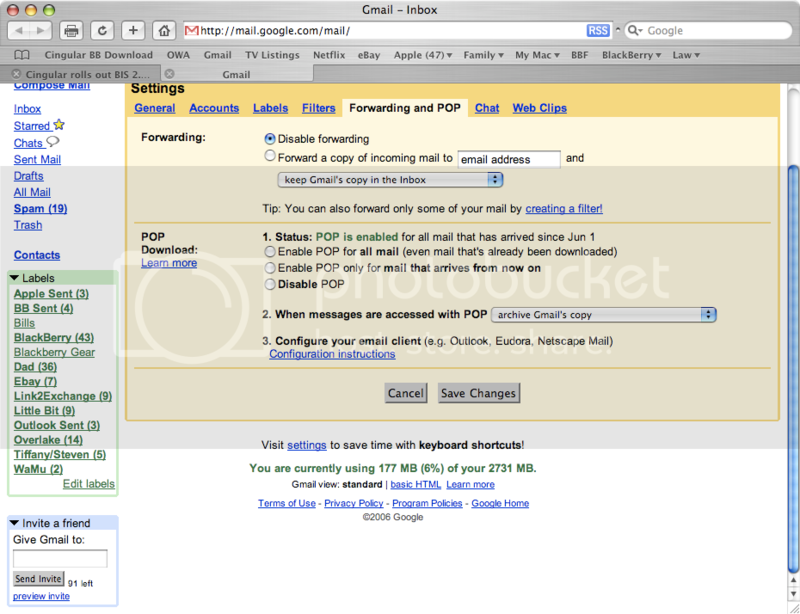 I meant if you are having Gmail forward your mail to your BIS account or have set up BIS to access your e-mail via POP.... Sorry for the confusion. Anyway, sorry to everyone else to go on this tangent. I'll stop here. I have BIS setup to access my Gmail via POP I believe. T-mo does charge more for standalone bb data, ten dollars more, so that isnt bad..